Notes app includes a variety of enhanced features for iOS and OS X users, but one that is particularly useful is the ability to make checklists easily in the app. As you probably guessed, the checklists are interactive, so you can check things off your own created lists or notes easily to help you keep track of progress or tallies, essentially turning a regular note into a To Do list. 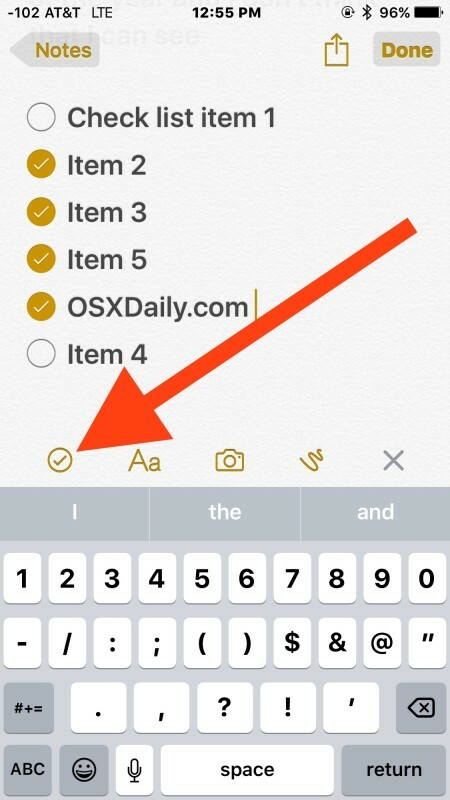 You can place a checklist in Notes for iOS amongst other items added to notes, whether that’s pictures and images that have been inserted or your own drawings made in the app. Just like in iOS these can be inserted just about anywhere with any notes, and they’re interactive too. Assuming you have iCloud enabled with Notes, your iCloud Notes with checklists and other changes will quickly sync between any Macs, iPhones, and iPads using the same Apple ID. A useful and welcome feature for list makers on both OS X and iOS, whether it’s for tracking getting things done, shopping, preparation, or otherwise. Bad assumption on my part, but I just went looking at the Notes app on 10.10.5 thinking I had always missed something. Maybe you could tag these articles with the iOS/OS X version(s) applicable? I agree, Notes app should allow for sharing notes with other users, privately. That’s a great idea. 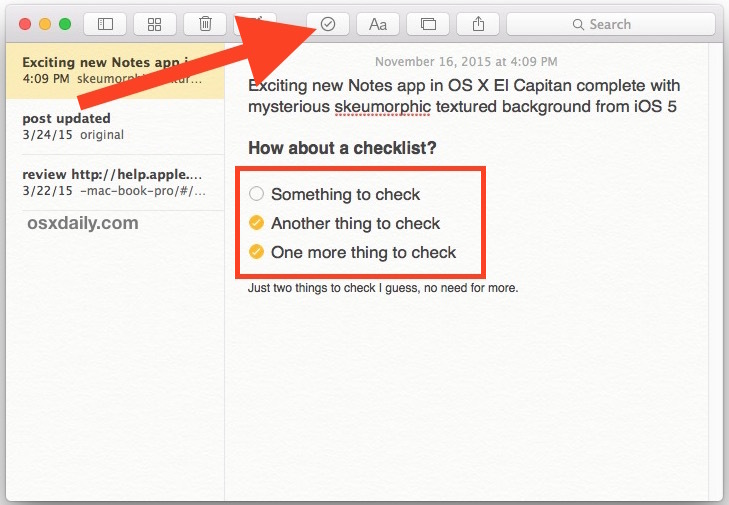 The checklist works for me, for IOS and Mac OS X. Not sure what other people are complaining about but it works flawless, follow instructions. Fwiw, Checkboxes and Text options do not appear for some non-iCloud based notes system. I just tried these suggestions for both latest version of OSX and iOS and they don’t work. The suggested icons are not there. On my machine OSX 10.11.3 this is not working. Check icon is present but constantly grayed-out. Just create a new note or open a existing one and it will work. Sorry read my post further down . Must be in iCloud notes on iOS . Ahhh… got it, Thanks Jim. The suggested icons are not in notes on my iPhone or my new MacBook Pro which I have just purchased at Christmas , so what do we have to do to find these versions of notes if notes has to be shareable where do we find how to do that .thank you . I just tried these suggestions for both latest version of OSX and iOS and they don’t work. The suggested icons are not there. The same goes for notes on the Mac, you need to go to iCloud Notes for it to work. I found how, finally. First, make sure to go to the listing of all notes in the notes app. Press “upgrade” in upper top right corner (on iPad). After that, I clicked the pencil icon for new note. Then (no + sign), but once I tapped to get keyboard display visible, the circled check mark was just above keyboard on left, along with the A’s for font size. Tapped the circle check and started typing. (Note that you’ll need to select the long underscore above the keyboard if your font size, check circle, and the suggested ” I The I’m” are not showing). I’m also a little confused by this as can’t find/activate this feature. Do you have to use iCloud as I am not prepared to put anything on a cloud server and especially not one in another jurisdiction. I had trouble finding the hovering + icon on iOS and found out I needed to go to the folder overview in Notes and click the upgrade button next to my local notes folder. After upgrading I got a lot of new features in Notes, including this one. It looks like this functionality requires the latest OS X, El Capitan. Would be nice to explain this instead of confusing people on lower versions and wasting their time. Dave, of course new features of software require new operating system versions. You may be surprised to learn that you can add checklists to modern iOS and OS X, but you can not add these checklists to your Apple IIe. That is how software works, new versions have new features. Old versions do not have new features, how would they? When click on the circle for a complete task, the check goes away as I scroll….!?? ?